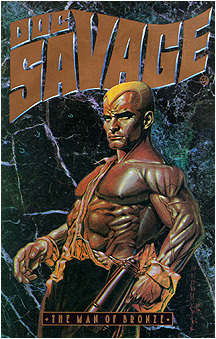 THE BRONZE JOURNAL is a magazine/file devoted to articles about Doc Savage and about hero pulps in general. It will be updated from time to time with articles and artwork as well as links to other Doc Savage sites. The Bronze Journal is one of a growing number of websites devoted to the legendary hero from the 1930's and, I hope, is contributing in some small way to keeping Doc's legacy going. Two articles by The Bronze Journal's new partner G. W. Thomas. G. W. Thomas lives in Central British Columbia. His work has appeared in WRITER'S DIGEST, THE ARMCHAIR DETECTIVE and the potter's magazine, CONTACT. He makes and sells horror art, including sculptures of famous monsters. Why Kenneth Robson doesn't write anymore. A reveiw of George Pal's 1975 film. A paean to a boyhood hero, the legendary crimefighter from the pulps of the 1930's. Member of the Doc Savage Web Ring!